WHAT AGES/LEVELS DO YOU ADMIT? We welcome any students ages 7-17. We will have 2-3 divisions based on registration. Older students will be working on more advanced writing of sketch and stand-up comedy while younger students focus on simple story telling. We welcome all levels of student. Improv is great as we use the same games to work with beginners and experienced / professional players. Each student becomes part of the team while individually nudged to their fullest potential. Class size varies, however we try to never put more than 10 students with one teacher. We will have a number of counselors and assistants to help teachers this summer. CAN I DROP MY CHILD OFF EARLY? or PICK UP LATE? We will have staff on hand 9am-5pm. For older students there is a bagel cafe on the corner, or Starbucks 1 block away. The building may or not be open prior to 9am. MY SON/DAUGHTER HAS FOOD ALLERGIES. DO YOU PROVIDE SPECIAL MEALS? Unfortunately we are unable to handle special dietary needs. We generally have pizza, sandwiches, tacos or similar. We have bottled water available all day long and other snacks. If your child has serious food allergies you may want to provide a bagged lunch daily. We do have a refrigerator to store containers during camp hours(never over night). 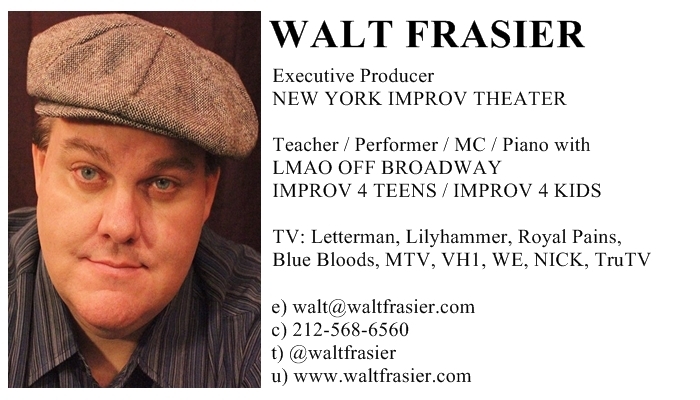 For additional questions, contact Walt Frasier, executive producer of the program.